During the recent financial crisis no issue has aroused more passion than financial institution bailouts. The standard rationale for the bailouts has been one of necessity and fear: federal regulatory agencies must have more authority in order to respond to the crisis, or else the public will face terrible consequences. But does this rationale hold up to close inspection? 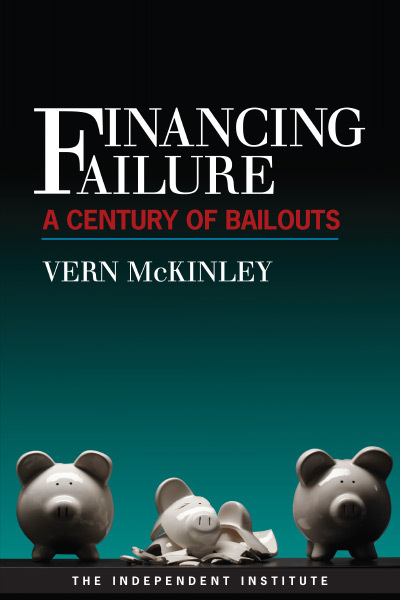 In Financing Failure, Vern McKinley approaches the topic by examining the policy decisions behind the bailouts and by showing their connection to previous government interventions. He brings under scrutiny the policy decisions made by the Treasury Department, the Federal Reserve, and the FDIC during the crisis of the 2000s and links them to policies that go back as far as the 1930s. This history of bailouts reveals that the genesis of financial crisis is government policy, be it the mismanagement of monetary policy during the 1930s or the political push to expand homeownership that helped cause the 2000s crisis. The nations federal financial regulators and the politicians claim to have saved the American economy. In truth they have done everything within their power to expand their own influenceoften far out of view from the public and media. Instead of openly explaining their actions, the bailout agencies have attempted to prevent the public from reviewing their decision-making, often at tremendous cost to taxpayers. McKinleys painstakingly researched and clear-headed analysis of bailouts and government intervention shows that the American public has accepted too many official pronouncements at face value, and that reining in the federal regulators is a necessary step toward truly promoting the safety and soundness of the financial system. 10. Will the Dodd-Frank Changes Stop the Bailouts? Perhaps no issue related to the financial crisis of the 2000s aroused more passion than financial institution bailouts. Although the crisis has been the subject of numerous articles and books, few have attempted to examine the policymakers decisions to bail out financial institutions, not just during the latest episode but also earlier in history. Vern McKinley remedies this shortcoming in Financing Failure: A Century of Bailouts. McKinley dissects the policy basis for the entire range of bailouts and probes the decisions and actions of the Treasury Department, the Federal Reserve, the Federal Deposit Insurance Corp., and other federal agencies, from the bailouts of the early 20th century to the present. His research reveals several findings overlooked by other studies of financial crises and bailoutsparticularly about banking regulators familiar, panicky responses and their post hoc rationalizations. Far from unprecedented, the latest financial crisis is eerily similar to the crises of the 1930s and 1980s. For example, in all cases new legislation approved by Congress was the source of the power to undertake the bailouts of financial institutions. Also, each crisis follows a familiar pattern: first, denial that a large Too Big to Fail bank is in danger, followed by a policy reversal rationalized by the claim that the bank not only is in danger, but that its failure would cause a disastrous, domino effect of failures throughout the financial system. The banking agencies analysis and response during the recent crisis, as well as in prior crises, was a completely seat-of-the-pants concoction. Much of the analytical justification was actually completed after a decision was already made or consisted of nothing more than idle speculation rather than robust factual analysis. The underlying justification offered for government intervention during the recent financial crisisthe idea that all manner of adverse consequences would flow from the collapse of a bank believed to be Too Big to Failwas unfounded. In fact, no clear evidence has been presented that would substantiate claims that the failure of an institution that was bailed out would have jeopardized the entire financial system. With each passing crisis, government interventions have become broader and more entrenched, with more of the financial industry receiving bailouts and more agencies becoming involved. The standard pattern is (1) financial crisis; (2) financial institutions approach failure; (3) panic by regulators and members of Congress; and (4) bailout legislation. Despite its official aims, it is highly doubtful that the Dodd-Frank Act of 2010 will prevent future crises from occurring or prevent a future Congress from authorizing bailouts. The financial crisis of the 2000s was rife with regulatory failure, and this pattern is also present in previous financial crises. Government agencies failed in their role as an early warning system to raise red flags about individual institutions, and they often acted at cross-purposes. Their mistakesincluding inconsistent and poorly articulated reasons for deciding which institutions would get bailed outundermined public confidence and hampered economic recovery. Polls conducted during the peak of the recent financial crisis showed that public opinion was overwhelmingly opposed to the bailout of banks and other financial institutions. If bailouts are very unpopular with the American public, why did elected officials give financial regulators greater authority to implement them? And how exactly did regulators decide when to bail out a troubled financial institution and when not to do so? In Financing Failure: A Century of Bailouts, Vern McKinley, a former legal advisor and analyst for several U.S. regulatory agencies, addresses these questions and many others related to federal agencies decision to save financial firms from collapse. Employing a masterful command of the available evidence, he dissects the policy basis for the entire range of financial bailouts and probes the decisions and actions of the Treasury Department, Federal Reserve, Federal Deposit Insurance Corp., and other agencies, from their inception to the present. Financing Failure not only shows why government regulators and politicians have become so reliant on bailouts, but it also depicts their habitually dysfunctional modus operandi during a crisis, often characterized by false assumptions and a panic-driven, not on my watch approach to policy implementation. Financing Failure can be read profitably by a general audience, but readers with backgrounds in banking, finance, or government affairs will especially appreciate the thoroughness of its account of the rise of massive bailouts and the bureaucratic decision-making that has rationalized them. Financing Failure begins by recounting the first bailout of the financial crisis of 20082009, the original sin as it has been called. In March 2008, following a sharp drop in its liquidity, Wall Street behemoth Bear Stearns found itself in serious trouble: an unusually large number of customers were withdrawing their funds from it, and corporate lenders were unwilling to lend it funds necessary to continue its operations. Unless the firm found relief immediately, it would be forced to shut down and many customers and clients would be left in the lurch. A series of late-night phone calls and emails led to a solution: JPMorgan Chase would provide a short-term loan, but only if the Federal Reserve Bank of New York would lend it funds via the so-called discount window. Worried that the failure of Bear Stearns would take down the banks with which it was doing business, the Federal Reserve Board agreed to the transaction and JPMorgan Chase was able to save Bear Stearns from immediate collapse. The seat-of-the-pants effort of the Fed also characterized later panicky regulatory responses to the crisis. The Feds indirect bailout of Bear Stearns illuminates many of the issues surrounding the subprime mortgage loan implosion that began two years earlier and the events that followed. But a solid understanding of the causes and consequences of bailouts requires answers to fundamental questions: What does it mean when a financial institution fails or suffers a run? What is the role of a central bank in addressing failures and runs? What constitutes a bailout? Answers to these questions explain the nature of bailouts and the evolution of central-bank lending. They also shed light on the legacies of financial regulations enacted in the twentieth century. Although the Federal Reserve Act of 1913 was supposed to end financial panics, the average number of bank failures grew by several hundred each year in the decade that led up to the stock market collapse of October 1929. Bank failures became even more common during the Great Depression, peaking at an estimated 4,000 in 1933. President Hoover created the Reconstruction Finance Corporation (RFC) to reduce the incidence of bank failures and restore depositors confidence in the bank system by providing secured loans to unsound banks. Bank failures continued until the agency was given authority to purchase preferred shares of banks and become heavily involved in the management of selected banks. The reduction of bank failures came at the price of reduced market discipline that acts to punish poorly managed banks. In the early 1950s, Congress phased out the RFC and gave the Federal Deposit Insurance Corporation (FDIC) new powers to assist troubled banks, including the authority to bail out creditors and shareholders of banks in danger of closing, a power not used until 1971. The FDIC faced one of its greatest challenges in 1974 when Franklin National Bank of New York, one of the twenty largest U.S. banks, experienced a massive run and lost nearly 50 percent of its deposits. The FDIC, the Federal Reserve, and the Office of the Comptroller of the Currency reacted by arranging a bailout of uninsured creditors and depositors. Federal regulators worried that without a bailout, financial markets would have been severely disrupted, but no regulator has ever released a detailed analysis of the expected disruption. The Franklin resolution marked a turning point: it was the first bailout of an institution deemed Too Big to Fail (TBTF), and it foreshadowed the method of future bank resolutions. It also suggested the lengths to which banking agencies would go to avoid the least hint of financial instability. The 1980s saw the greatest volatility of the U.S. financial system since the Great Depression, with the number of failed banks and savings and loans (S&Ls) growing significantly until the end of the decade. The number of bailouts also grew. The bailout of Continental Illinois, the seventh largest bank in the country at the time, was the most significant of the eraanother case of Too Big to Fail. By the late 1980s and early 1990s, the industry concluded that the safety net had been broadened too much and that the Too Big to Fail doctrine had to be reversed. Big banks, one industry spokesperson testified, neither wanted nor needed TBTF. Policymakers debated whether to allow TBTF interventions only when a bank failure posed a systemic risk to the financial system. Proponents of TBTF had no evidence to support their claim that particular bailouts were necessary to prevent the entire financial system from collapse. Unlike during the Great Depression, where there was evidence of a dramatic drop in bank deposits and a flight to currency, no data was presented of a similar effect during the 1980s that would justify bailing out the largest financial institutions. Although Democrats in the House of Representatives pushed to end TBTF, the final version of the 1991 reform legislationthe Federal Deposit Insurance Corporation Improvement Act (FDICIA)left TBTF in place. FDICIA also gave the Federal Reserve new powers to lend to securities firms. The financial crisis of the 2000s surprised the heads of the Federal Reserve, the Treasury Department, and the FDIC, but their responses should have surprised no one: they repeated their predecessors reactions to the bank and S&L crises of the 1980s by undertaking bank closings, massive ad hoc bailouts, and efforts to acquire new powers. Under Chairman Ben Bernanke, the Fed took the lead in shielding the identities of weak institutions, supposedly so that none would be stigmatized in the marketplace and suffer further losses. False narratives prevailed about why a particular firm was bailed out (Bear Stearns, AIG) or not (Lehman Brothers). In reality, it was far from clear that a Bear Stearns bankruptcy would have instigated a financial meltdown, nor was it clearly a mistake to have let Lehman file for bankruptcy. Nor was AIGs collapse caused by the firms exploitation of a gap in the supervisory system: the Office of Thrift Supervision had monitored AIG and believed the insurance giant had enough liquidity to weather losses from its credit default swaps. Fannie Mae and Freddie Mac faltered during the 2000s crisis much more than during the 1980s crisis. In the mid-1990s, they began to move into the subprime-mortgage market due to pressure from the White House and Congress to fulfill affordable-housing goals. Unfortunately, just as the mortgage market began to deteriorate in 2007, the constraints on Fannie and Freddie were loosened. Secretary Henry Paulson and Chairman Bernanke testified that the agencies were well capitalized, but a different story was suggested by the passage of the Housing and Economic Recovery Act of 2008. Although it granted the Treasury broad powers to support the agencies and created a new oversight authority, large foreign investors were not reassured and both Fannie and Freddie were placed under government conservatorship. FDICIA, the 1991 reform, allowed for the bailout of firms believed to pose a risk to the financial system. This exemption created strong incentives for consolidation in the banking industry in the 1990s and 2000s and may explain the proliferation of megabanks during the period. But the law provided no guidance for determining when systemic risk was present. Hence a few differences of opinion arose among the bailout agencies. For example, the FDICagainst pressure from Treasurydecided to close Washington Mutual and cover insured depositors rather than to bail it out. Interestingly, FDIC Chairman Sheila Blair reported that she was not completely comfortable with the decision to bail out a different bank, Wachovia. The severity of the problem facing regulators can be seen from the failure of Troubled Asset Relief Program (TARP), a lending program originally intended to relieve commercial banks of their faltering mortgage loans, but which was broadened to include other interests, including automakers. Banks did not respond by making loans, but instead simply sat on the hundreds of billions of dollars of TARP funds throughout 2008 and 2009. The most important reason banks gave for doing this, according to the Feds opinion surveys, was an uncertain economic outlook. The most important legislative response to the financial crisis and the unpopular bailouts is the Dodd-Frank Wall Street Reform and Consumer Protection Act, signed into law in July of 2010. This law was meant to end taxpayer bailouts, as well as to meet other goals, but the likelihood that it will do this is quite small. The idea that a present-day Congress can prevent a future Congress from the standard response of passing an ad hoc bailout in the midst of a crisis is fanciful. Moreover, Dodd-Frank includes provisions that tax well-managed financial institutions to compensate the creditors of poorly managed institutions. The only way to avoid a replay of the historic pattern of crisis-panic-bailout is for policymakers to learn how wasteful, unnecessary, and destructive bailouts have proven to be and to resist short-term political temptations in favor of long-term prudence. Rather than repeat the mistakes of their predecessors, policymakers should simply allow for the closing of failed institutions, no matter their size or complexity. Vern McKinley is a Research Fellow at the Independent Institute. From 1985 to 1999 Mr. McKinley worked with the Board of Governors of the Federal Reserve, Federal Deposit Insurance Corporation, Resolution Trust Corporation and Department of the Treasurys Office of Thrift Supervision. In 1995, McKinley graduated with honors from George Washington University School of Law. Since 1999, McKinley has served as a legal advisor and regulatory policy expert for governments on financial sector issues in the United States, China, Nigeria, Indonesia, Ukraine, Kazakhstan, Latvia, the Philippines, Yugoslavia (now Montenegro), Kenya, Morocco, Sudan, Libya, Afghanistan, Armenia, Kosovo, and Tajikistan.